We are absolutely thrilled with Lugana's latest offspring. Sangria Sunrise was born May 9 and is beautifully put together and super uphill! She was a premium foal and Top Filly at her OLD NA Inspection. She is owned by Split Mesquite Farm. 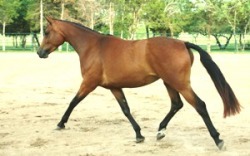 Ana is a beautifully put together filly with a phenomenal walk and canter. She is a beautiful, tall filly with an unbeatable temperament! She is owned by Split Mesquite Farm. 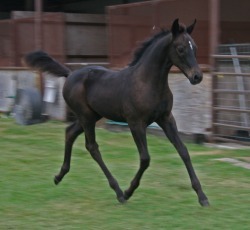 We are very pleased by Lugana's 2010 colt. Very well put together, leggy with a great temperament. He is owned by Split Mesquite Farm. Star Charmer was a Premium Filly with the RPSI. Star Charmer was bred by Lucy Sharp of Royal Equus Farm. Star Charmer was accepted into the Main Mare Book of the AHS in 2012. She is owned by Helga Venus. High Roller was a premium colt at his BWP Inspection. 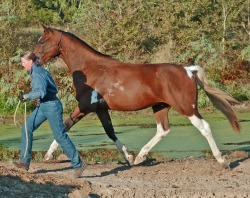 He was bred by Royal Equus Farm. 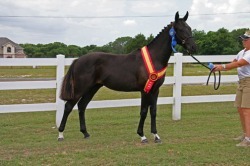 Sine Die was the 2012 Hanoverian Mare Champion at her AHS Inspection. 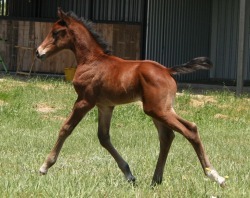 Rip Rap was bred by Hazel Clinton of Hy Court Farm.